Antigua Guatemala, located in the central highlands, was founded in 1524 as Santiago de Guatemala and was subsequently destroyed by a fire that was a result of an uprising of the local indigenous population and then re-established in 1527 - the city was completely destroyed by an earthquakes and avalanche in 1541. The 3rd location, in the Valley of Panchoy or Pacán, was inaugurated in March 1543 and served for 230 years. It survived natural disasters of floods, volcanic eruptions and other serious tremors until 1773 when the Santa Marta earthquakes destroyed most of the city. San Francisco Convent: It was the 2nd convent. Its story began in 1530, and in 1540 the convent was very well-known. In the 2nd half of the twentieth century it was given the authority to become the Archdiocesan Shrine of Hermano Pedro. San Francisco Church: San Francisco is one of Antigua’s oldest churches. 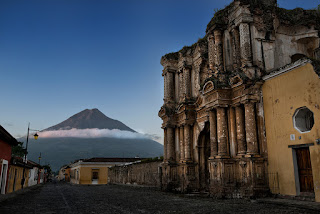 Its main claim to fame is the tomb of Central America’s first saint, Hermano Pedro of San José of Betancourt, a Franciscan monk who came to Antigua Guatemala from the Canary Islands and founded the Hospital of Belén; he has been credited with miraculous healings. In the south side of the church, is located the Hermano Pedro museum along the ruins of the adjacent monastery. Church and Convent of Las Capuchinas: Las Capuchinas is located in 2nd Avenue North and 2nd East Street, and it is open from 9 am to 5 pm very day of the week. Abandoned after being destroyed in the earthquake of 1773, it's restoration began in 1943 and is still under repair today. The convent’s foundation dates to 1726, there are beautiful fountains and courtyards flanked by sturdy stone pillars with arches and bougainvilleas flowers, that are the center of attention of many tourists and photographers - many consider it the most elegant of the convents of Antigua Guatemala. Church and Convent of Santa Clara: Santa Clara is located in the 2nd Avenue in the South, #27, it is open from 9 am to 5 pm, every day of the week. It was founded in 1700 and it construction began in 1703, but was destroyed in 1773 by an earthquake. Its ruins are very pleasant for a stroll and you can also enjoy La Unión Park, located in front of the church’s main entrance. Church and Convent of Nuestra Señora de La Merced: Known more commonly as La Merced, this is one of most beautiful churches in Antigua Guatemala, painted in a bright yellow and adorned with white ornaments on its columns. Inside the church are the ruins of its old monastery. It is located in 5th Avenue in the North and 1st western street, opened from 9am to 6:30pm. Church and convent La Recolección: Located on La Recolección Avenue, this huge church built between 1701 and 1715 was severely damaged in 1717, the same year it was inaugurated. The earthquake of 1773 finished with the construction and it has lain in ruins ever since.